There’s a good rule in digital photography called ETTR (Expose To The Right), that says that you should aim for your histogram to be as heavy loaded to the right side as possible (brighter), while avoiding clipping the whites. Once you clip a color (you go outside the possible values, so a white can only be white, there’s no brighter white), there’s no way to recover that data, but you can try and push it as close as possible to get the best data. This works great in most cases, you get more data to work with, less noise, you can simply pull down the exposure slider and your image will look great. But it doesn’t always work as intended, as I just found out while editing some sunset photos. In this case, the optimal image to edit should be the third, it’s very heavy to the right side, and does not clip any of the bright values. More data to work with! ETTR version shows no color separation when pulling the exposure down. As we pull the exposure down, there is no noise in the data, but there is also no color separation in what should be pink clouds! Each RGB channel has loads of data, but they all land in the same peak, therefore creating a lame white/gray color as the colors blend together. A more balanced exposure works better for this case, instead of ETTR. 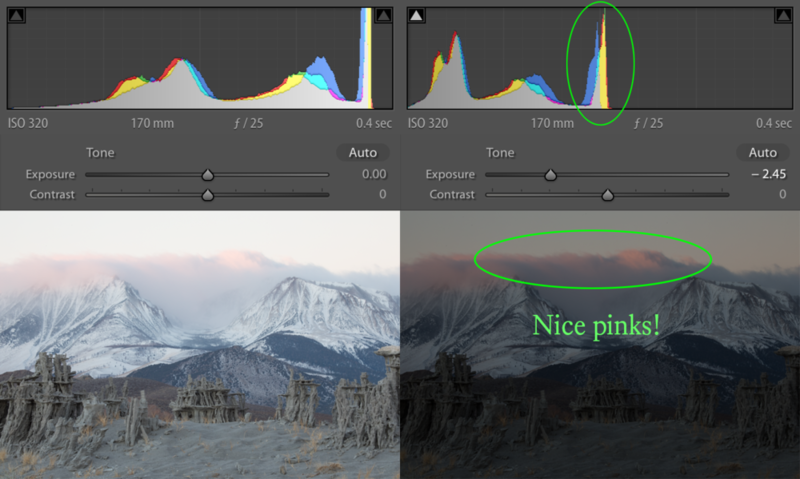 With the non-extreme, balanced photo, when we pull the exposure down, the color separation is clear and we can see the original pinks. It’s important to read the histogram and avoid a large peak close to the edge. This image also had a peak towards the right, but not tightly crunch to the very edge of the histogram, and it was a much wider column. Using ETTR will give you extremely clean images to work with, where you won’t have as much noise in the shadows, and you’ll be able to tweak the exposure a lot without sacrificing image quality. ETTR is absolutely great in most cases, but make sure you aren’t just looking for clipping, but also for extreme peaks too close to the right, where ETTR can fail due to crunching too much data in a single range of RGB values. This type of image is not good for ETTR. This type would be ideal for ETTR. I have a few photo series that I’ve never fully published, because spamming a social media feed with lots of similar pictures feels a bit out of place to me. But I always wanted a place to share them together. This blog seems like the right place, where I can tell a full story and show the complete set of images. To start these photo series, I’ll go back to Yellowstone in 2015 when I photographed a bull elk resting next to the warm steam of the fumaroles at the West Thumb Geyser Basin. I followed the elk for about an hour, careful to keep him against the setting sun, and with the steaming fumaroles behind him, until he finally went to rest. I used no filters. Instead, I let the sun hit straight into the lens by removing my lens hood, and by shooting through pine needles that flared and streaked golden light into the camera, creating colorful bokeh effects. Shooting without the lens hood and with blurry foreground elements sometimes tinted the image orange, sometimes green, and sometimes turned it into a soft, low-contrast gray. The larger bokeh effects were from the pine needles, which sometimes directly touched my lens and sparkled under the direct sunlight. 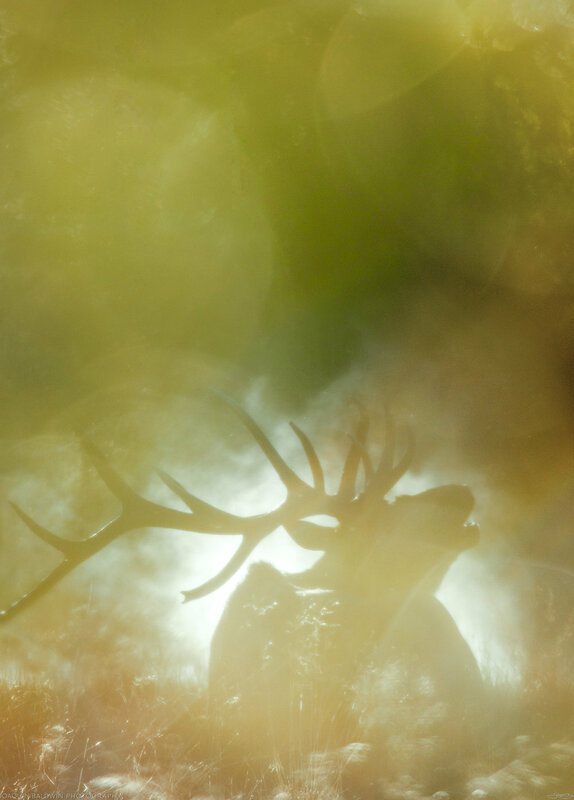 Before the elk had settled down, it had been grazing among the tall grasses, dipping his head into the gold. I took two close-ups, focused on the antlers, that I think serve as perfect bookends. This was a magical moment I’ll never forget. Yellowstone is so full of wonders, the alien landscape should be enough, but you also get the incessant flow of wildlife on top of it, always around you and always diverse. I built a new website! This time I’m focusing all my efforts towards photography, but still keeping my animation, 3d design, layout and illustration work available. I’m using the new logo and branding I had been working on months ago, and trying out Squarespace for the hosting and services. Squarespace seems to do exactly what I need it to do, as long as I take my time to carefully customize CSS codes and add my own details for the design. But the functionality is right, managing the content has been extremely easy, and the shop integration will come in handy once I finish setting that up. One thing that is not as versatile as I hoped, is the gallery options. I wish I had more control over the look of the galleries without too much manual CSS coding, but the default options look professional and are versatile enough for now. Here’s a look at how my websites have evolved, since I was a “hacker” with a warez page in the 90’s, to when my focus switched towards animation, then a darker tone redesign, followed by a clean white during my obsession with 3D printing, and now on to photography. And what is this about a blog? What year is it? I’ve been good about posting constant updates on Facebook, Twitter and Instagram, but I felt like a lot of the images I post need a more connected structure. Every once in a while, I want to write something slightly longer, with multiple images, describing specific projects I’m working on and adventures worth sharing. I might also talk more in depth about my process, gear, and techniques I use, as well as any research I put into my photo projects.